It’s almost the end of 2011, and Google has made their annual video of the world in review. They did a surprisingly good job this year. P.S. I didn’t make this. I was at the YMCA when I saw this sign. 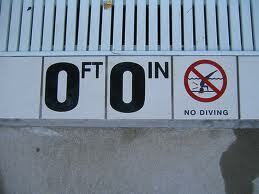 This raises the obvious question: If there is no diving in zero feet zero inches, why isn’t there a sign like this everywhere? There should be a sign in front of your house, like a doormat or something, that warns people not to dive onto your concrete. I mean, look what happened to the stick figure when he dived without water. Let me first say that I did not choose to read Little House In The Big Woods. Yes, its sad, but I was forced. Anyways, back to the Headcheese. According to Little House in the Big Woods, Headcheese is a delicacy that comes from the tender, moist flesh on a hog’s face. For all of you out there that want to try to make Headcheese in your own kitchen, try this classic recipe. Step 1: Find a hog. Step 2: Kill your hog. Step 3: Behead your dead hog. Step 4: Boil head in big pot till the meat “falls off the face” as described in book. Step 5: Mash the meat together. Step 6: Invite your friends and family over for a yummy meal of hog-face, its sure to be a crowd-pleaser! Fun Fact: Headcheese isn’t really cheese, its just gelatinous, jello-like fat from a hog’s face.